Your nose feels dry and stuffy. You can try adding a humidifier to moisten the air from the CPAP machine. Some people prefer moist heated air. Your nose feels blocked up. Some people with sleep apnea have a nose problem. Ask your doctor if you have a nose problem that can be treated with a nose spray. Surgery also is an option. Some people who breath through the mouths don’t do well with CPAP nose masks. A full face mask that covers both the nose and the mouth may help these people. You don’t like the pressure. You may find that breathing out against the air pressure keeps you from sleeping deeply. Your doctor may ask you to use a bilevel machine that lowers the air pressure when you breathe out. 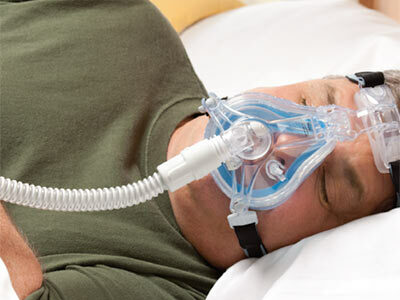 The same mask may be used with CPAP and bi-level machines. You take the mask off during your sleep or don’t wear it every night. Most people can’t wear the mask all night long, every night, right from the start. Keep trying, even if you can only use the mask for an hour a night at first. Once you solve your comfort problems, you will be able to increase the time you wear the mask. Always try to wear the mask in the early morning hours, when sleep apnea is usually the worst. You just can’t get used to the mask. Some people find that wearing a dental device that pushes their tongue forward helps. Or talk with your doctor about having throat or jaw surgery. CPAP devices are not to be adjusted by patients – CPAP units are prescription devices and must be changed by certified professionals! CPAP units are adaptable from 110 to 220 volt requirements with an external adaptor – Adaptors can be purchased at most electronics retailers for a nominal fee. Literature concerning CPAP use that is distributed by MRC Healthcare, Inc. is offered for information purposes only and should not be considered a substitute for the advice of a healthcare provider.